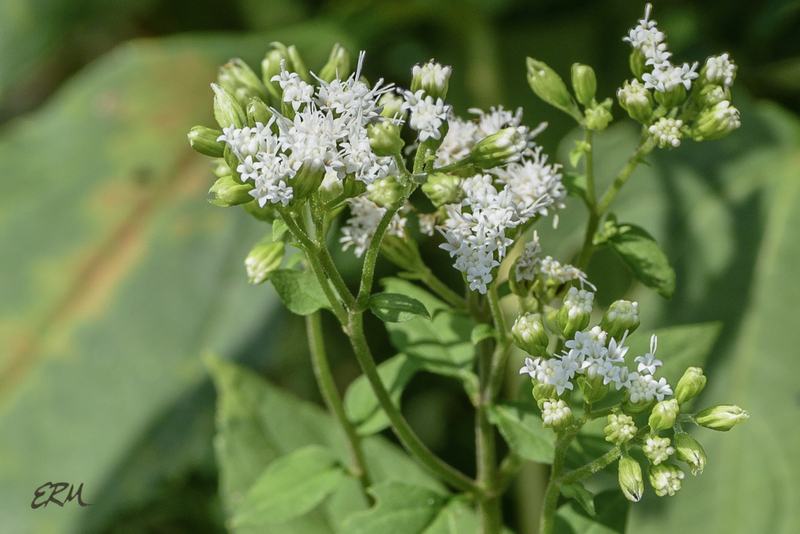 Now that we’re into October one of the white-flowering aster family plants I wanted to write about (late-flowering thoroughwort or late boneset) is just about done blooming, but the other one (white snakeroot) is going strong still. Both of these plants were once placed in the genus Eupatorium, but in 1970 the snakeroots were moved to the genus Ageratina*. Interestingly, it took a long time for the guidebooks to catch up. 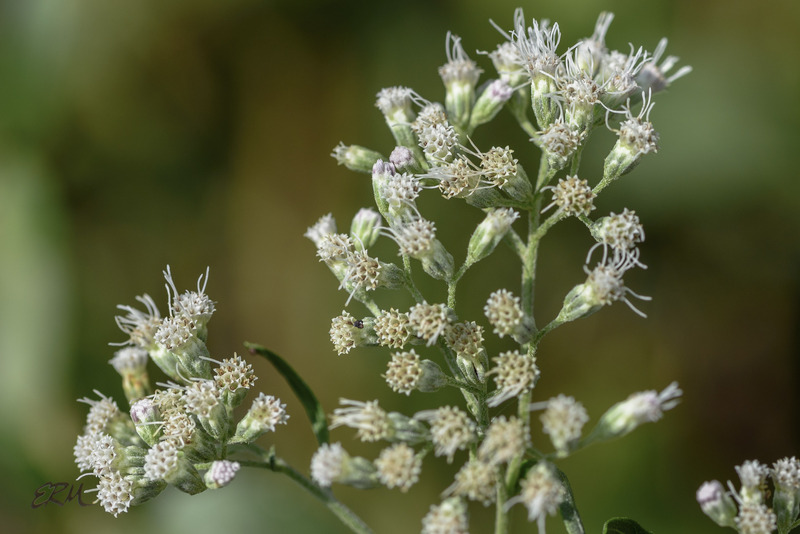 Newcomb’s Wildflower Guide (1977) and Field Guide to Wildflowers (National Audubon Society; 1979) still refer to white snakeroot as Eupatorium rugosum. 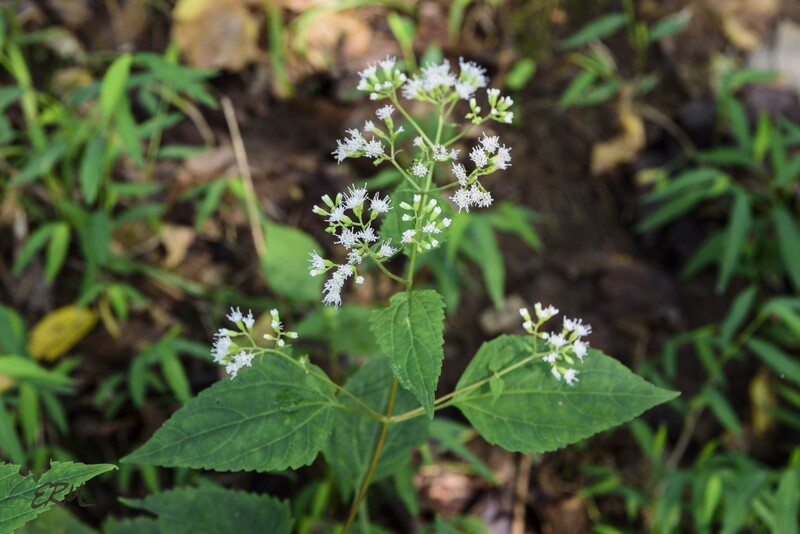 The earliest printed reference to white snakeroot as Ageratina altissima that I can find (in my small library) is from 1993, in The History and Folklore of North American Wildflowers (Timothy Coffey). But enough about taxonomic history; more about the plants: from a distance they look similar: tall, leafy forbs with large arrays of fuzzy, white, joe-pye-like flowers. But close up, the differences become clear and it’s trivial to tell which species is which. 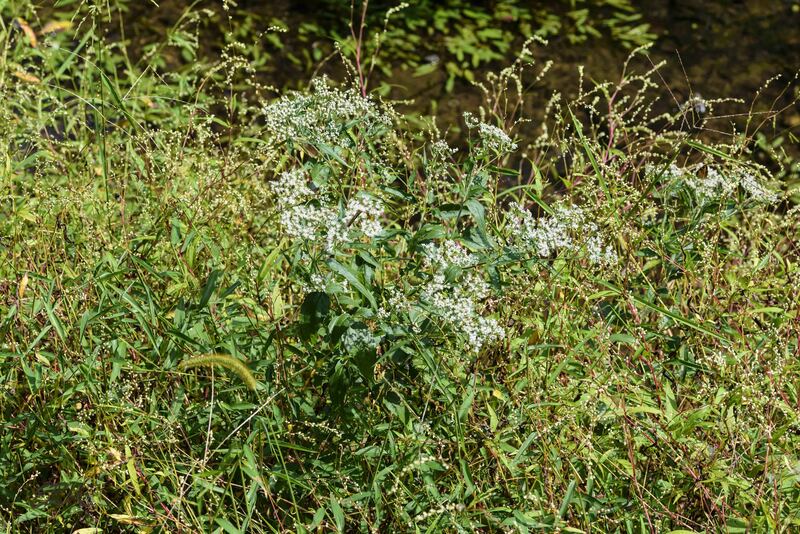 Despite the name “late-flowering thoroughwort”, Eupatorium serotinum blooms in August and September, while Ageratina altissima blooms from September into October (this year, anyway). E. serotinum stands about a meter or two tall; A. altissima stands at about a meter at most. Both tend to be single-stemmed with occasional branching, more so up top. The flowers of each are borne in corymb- or panicle-like arrays, E. serotinum tending to be a bit flatter overall, and A. altissima being somewhat rounder. Both species produce only disk flowers, the long styles protruding to give a feathery effect (like in joe-pye weeds). Most of the time the flowers of E. serotinum seem more tightly bunched together and more tightly closed, while A. altissima flowers are more open, the five petals easy to see. Also note that the phyllaries of E. serotinum are covered in fine white hairs (A. ageratina phyllaries sometimes have a few sparse hairs). Here’s where it’s easy to tell the difference. Both plants have opposite leaves (mostly). The leaves have petioles, but the leaf shapes are distinctly different. E. serotinum has lance-shaped leaves that often curl in a bit at the edges. 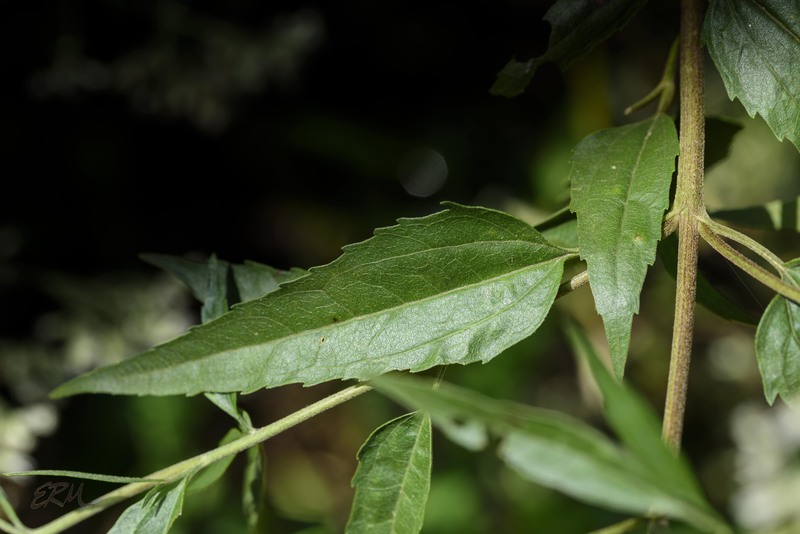 A. altissima has more-or-less ovate to heart-shaped leaves. Keep in mind that, as with so many aster-family plants, the leaves tend to get smaller and more linear further up the stem, and near the inflorescence they can be alternate rather than opposite. Both of these species can be found in the eastern half of North America; E. serotinum‘s range is more southerly (it barely gets into New England), and A. altissima’s range is more northerly (it barely gets into Florida). 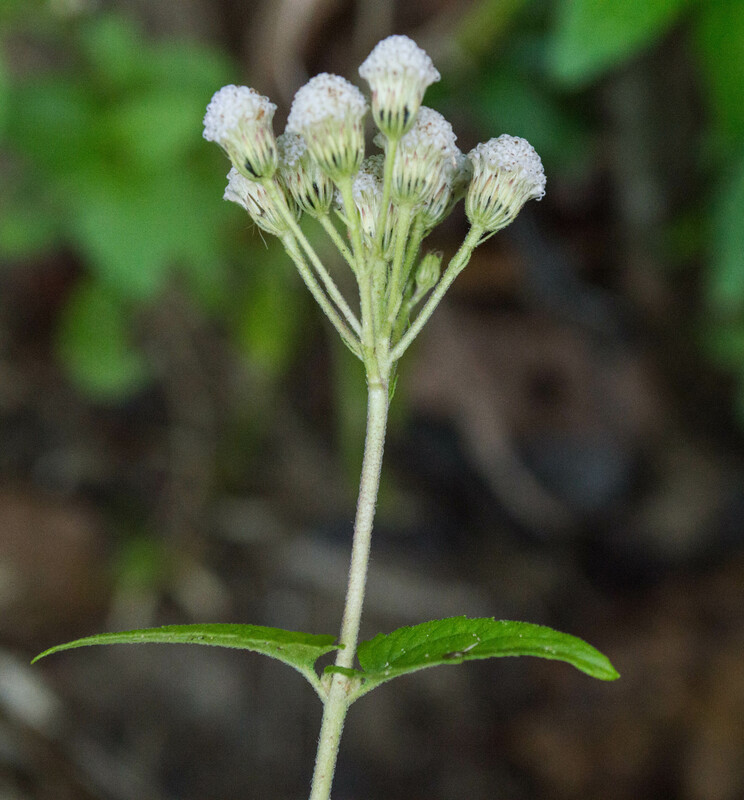 Late-flowering thoroughwort is one of about a dozen or so Eupatorium species whose native range includes the Maryland Piedmont. For three years now I’ve been wanting to write about all of these, but I don’t have pictures that clearly illustrate the differences. Also, the taxonomy is a bit confusing. I need to make a study of it when I can find good examples of the plants, key them out, and take better pictures. 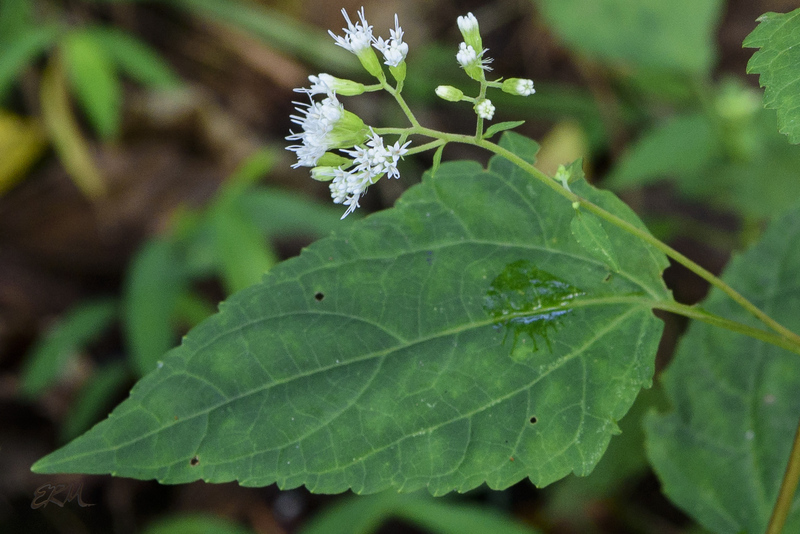 There’s only one other species of Ageratina in Maryland, A. aromatica, aka lesser snakeroot. Here’s a picture from 2014; I haven’t seen one since. 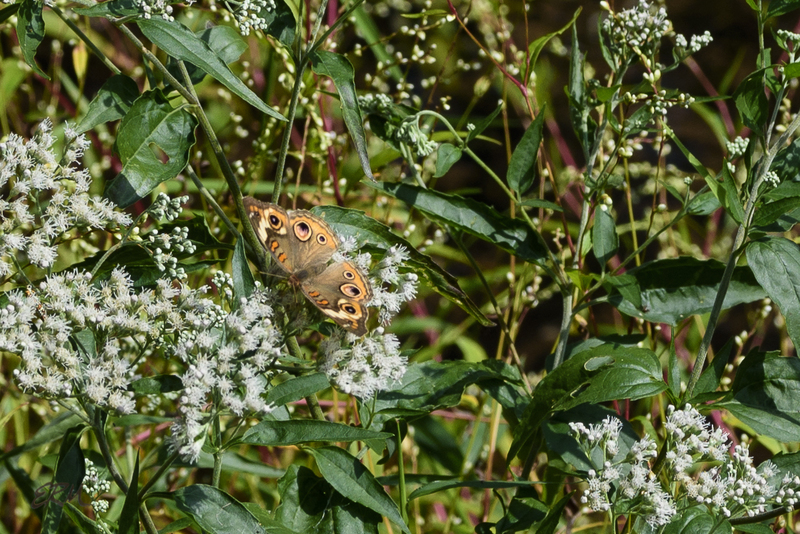 This entry was posted in Uncategorized and tagged Ageratina, Asteraceae, buckeyes, Eupatorium by elizabeth. Bookmark the permalink. Both of these plants grow naturally all over my yard in Silver Spring, MD and up until this year I’ve been lumping them as white snakeroot. I now know they are actually two different plants. Nice to know and be able to tell them apart. Both are pollinator magnets. It always makes me happy to know one of my posts has been useful to someone. I would not have recognized that as an astery thing. I suppose it should be obvious upon closer inspection, or in the first picture. It sounds something like a fancy department store.